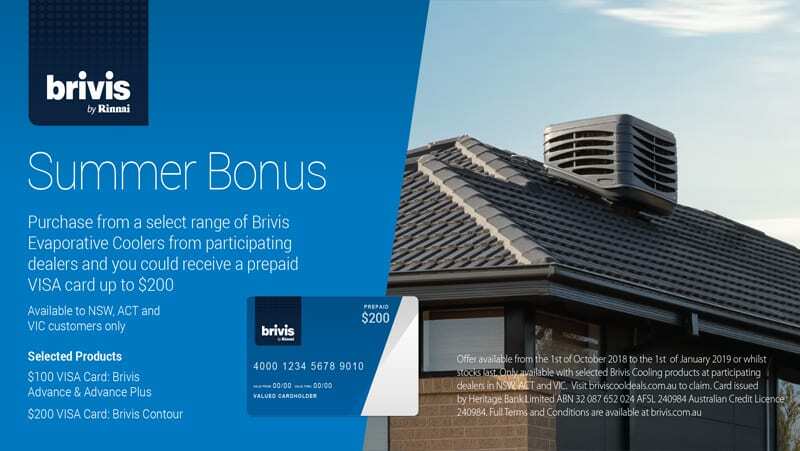 Purchase & install a Brivis Evaporative Cooler from a selected range between 1st of October 2018 and 28th of February 2019 from Plum Heating & Cooling and receive a Prepaid VISA card up to $200 as the Brivis Cashback Offer. Brivis is giving away a Prepaid VISA Card up to $200. Simply Purchase and Install a Brivis Evaporative Cooler through Plum Heating & Cooling and claim your Brivis Cashback prepaid VISA card. Manufacturer conditions apply. This offer is valid from 1st October 2018 to 28th of February 2019 and available via online redemption only through the Brivis Website. Click here for full Terms & Conditions and to Claim your Brivis Prepaid VISA Card. You will need to upload a receipt showing payment has been paid in full along with the Brivis unit model number, the serial number and the date of purchase. All this information will appear on your final receipt which is posted out with the Compliance certificate a few days after the job has been completed. If you urgently require this info, please give us a call and we will give you the details over the phone. Purchase an eligible Brivis Evap during Offer Period. Pay for in full and record serial number. Once validated, wait for your Prepaid Visa to arrive in the mail. Ducted Heating and Cooling – Are They Really Necessary?